The public can now weigh in on the Trump administration’s regulatory rollback. The Environmental Protection Agency is poised to dismantle the federal clean water rule, which protects waterways that provide drinking water for about a third of the U.S. population. The EPA, with the U.S. army, has proposed scrapping the rule in order to conduct a “substantive re-evaluation” of which rivers, streams, wetlands and other bodies of water should be protected by the federal government. “We are taking significant action to return power to the states and provide regulatory certainty to our nation’s farmers and businesses,” said Scott Pruitt, administrator of the EPA. Pruitt said his agency would swiftly redefine clean water regulations in a “thoughtful, transparent and collaborative” way with other agencies and the public. 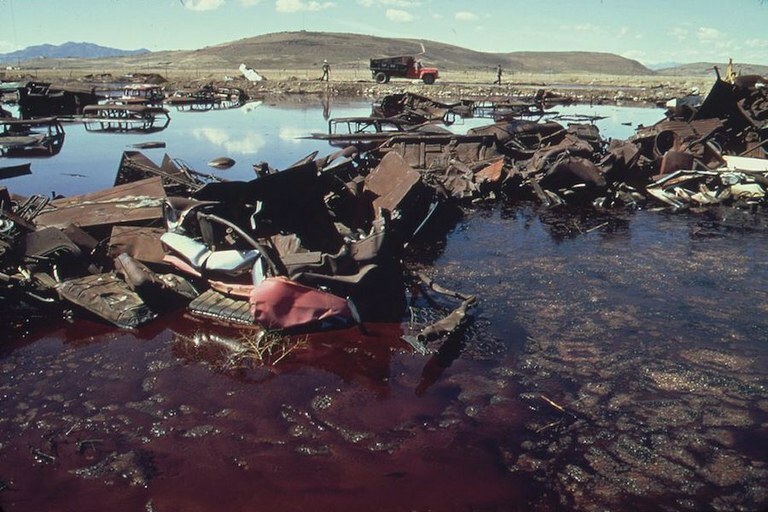 Acidic water, oil and acid-clay sludge in a five-acre pond that was later cleaned up by the Environmental Protection Agency to prevent contamination of the Great Salt Lake and a wildlife refuge near Weber, Utah. Historical pollution prompted the implementation of regulations like the Clean Water Act. Green groups, however, said the move pandered to fossil fuel and farming interests and was part of an agenda to weaken clean water protections. The planned rollback follows an executive order penned by President Donald Trump in February which called for a review of the regulation, also known as the waters of the United States rule, that was introduced by the Obama administration in 2015. The rule was meant to end years of confusion over which waterways were federally protected from pollution, with the clean water rule simply designating “navigable” waters for safeguards. The Obama administration widened this definition to include the drinking water of about 117 million Americans. But while the rule was applauded by environmentalists for improving drinking water protections and aiding wildlife that relies on wetlands, it was attacked by some farmers and golf course operators who claimed it hindered their ability to manage their land. While “puddles” aren’t mentioned in the rule, the EPA does have greater latitude to regulate under it. However, there is no evidence that the regulation could result in the loss of thousands of jobs. The National Mining Association, another opponent of the rule and representative of an industry relentlessly backed by Trump, welcomed its impending demise. “This sets in motion a welcome correction to a deeply problematic regulation that ignored the careful balance that Congress struck between federal and state water regulation and constitutional limits on federal authority,” said Hal Quinn, NMA president and chief executive. The clean water rule reversal, which will now go through a period of public comment ahead of a final decision, is the latest in a string of regulations to be paused or scrapped by the Trump administration. In recent months, the EPA has wound back rules curbing vehicle emissions, toxic waste from power plants and methane leaks from oil and gas drilling operations.